Abstract: The authors of this monograph seek to continue the scholarly dialogue and break fresh ground in research on the history of ancient Hebrew. Building on theoretical and methodological concepts in general historical linguistics and in diachronic linguistic research on various Ancient Near Eastern and Indo-European languages, they bring to the fore and reflect critically on fundamental issues such as the objective of the research, the nature of the written sources, and the notions of variation and periodization. They draw on innovative work by experts on premodern scribally-created writings in English, French, and Spanish, arguing that a similar application of a joint history of texts and history of language approach will advance our understanding of language variation and change in ancient Hebrew. They illustrate the progress that can be made through the application of two conventional historical sociolinguistic methods. The first method, cross-textual variable analysis, compares linguistic variants in different versions of the same writing, and is applied first to four sets of parallel passages in the Masoretic Text of the Hebrew Bible, and then to the Masoretic Text and the four Dead Sea Scrolls biblical manuscripts of the book of Samuel. The study of Samuel is accompanied by an extensive commentary on linguistic variants between the Hebrew texts of this book. The second method, variationist analysis, compares changing proportions of occurrence of linguistic variables in different writings, and is applied to an assortment of lexical and grammatical issues in the Hebrew Bible (Masoretic Text, Samaritan Pentateuch, biblical Dead Sea Scrolls), monarchic-era inscriptions, the Wisdom of Ben Sira, and the non-biblical Dead Sea Scrolls. 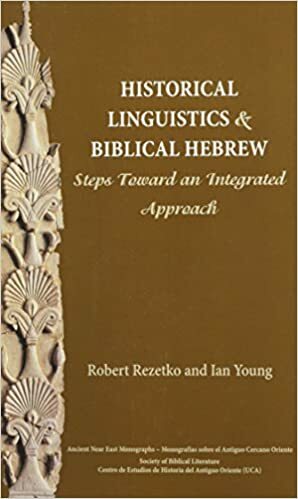 The application of the two methods in the various case studies shows that previous accounts of language variation and change in ancient Hebrew are inadequate, and that more complete descriptions and evaluations of the distribution of linguistic data using the integrated text-language approach will advance and enrich our understanding of historical developments in ancient Hebrew.